The PM just brought the country’s biggest security and intelligence agencies together to form one super portfolio and put Peter Dutton in charge. It’s a whole lot of politics but it’s also a pretty dramatic restructure that changes who is responsible for ASIO and the AFP. 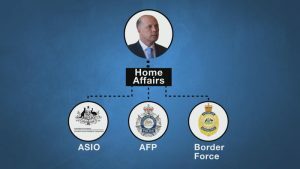 It means one minister is responsible for those agencies as well as the Australian Border Force but the Government says it won’t be a US-style department of homeland security. These are separate departments being reorganised under a new cabinet position: the Home Affairs Minister. For the first time, Australia will have one minister focused solely on matters of intelligence and counter-terrorism. Until now, this responsibility has been shared. We still have the Attorney-General’s Department, but it will no longer be responsible for our domestic spy agency. It will focus on legal matters, rather than national security. Those responsible for border security, federal police and domestic intelligence will report to one minister, rather than three. Mr Dutton retains responsibility for Immigration and the Australian Border Force.